Manage the connections to your trading account(s). The broker manager dialog allows you to set up, connect and disconnect trading accounts. Each trading account must use one of the integrated order routing APIs. Depending on the edition you purchased you may have access to no order routing APIs, to some of them or to all of them. You must ensure the license you purchase has entitlements for the order routing API you need. 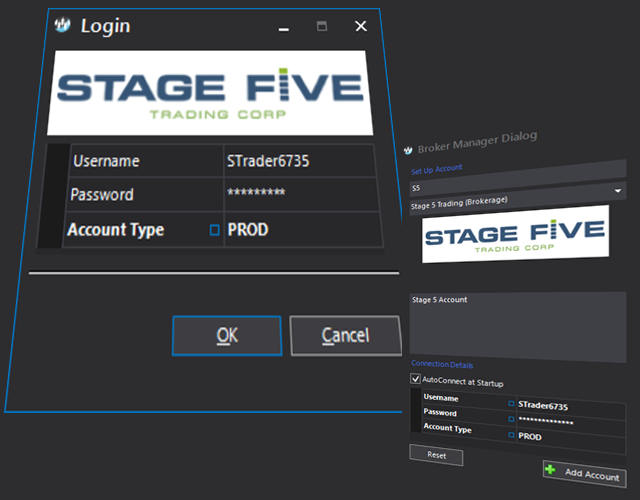 Trading accounts set up in the S-Trader must connect via valid demo or live trading account credentials. It is your responsibility to obtain those credentials from your broker. Most of the time the credentials used by the broker manager for one particular order routing API would be identical with the credentials used by the corresponding broker data feed connector. There currently are five order routing APIs available in the S-Trader desktop platform. Our list of integrated order routing APIs is continuously growing.